In Ayurveda, Pitta is one of the three doshas that governs the metabolism, transformation, and heat that takes place in the body. It also governs the digestive fire of the body. Imbalance of pitta dosha produces symptoms in intestine and stomach and may also lead to imbalanced metabolism and digestive strength. Amalaki is the most traditional herb used in Ayurveda that eliminates pitta and prevents its accumulation in the body. This herb acts as an antioxidant that promotes regularity and eliminates the toxins from the body. It provides strength to the immunity and prevents the body from infections. Consume 10 to 20 ml of Amalaki along with 3 to 5 gm of jaggery powder. This remedy shows good results if it is taken before the meal. Add Amalaki powder in a container of water. Boil it in mild heat and stir it continuously. Filter it and allow it to cool down when it is reduced to approx 50 ml. This is an ideal home remedy to pacify Pitta Dosha. Neem is the most effective and extremely bitter herb used in Ayurveda. Due to its bitter taste, it is effective in eliminating pitta dosha from the body and also useful in various medicinal purposes. This herb imparts a cooling effect on the body. It improves the digestion process and absorbs moisture from the intestine. Make a paste of neem powder with honey or water and apply this paste over the skin or wounds. The decoction of neem water is useful in infection like infected pile mass or fistula, perianal abscess. Coriander is a very good antioxidant that inhibits the oxidation process and resists the builds up of radicals. This herb is used as a brain tonic. It is useful in treating asthma, breathing difficulty and COPD. It relieves excessive thirst and also useful in increasing urine volume. It improves the taste and increases appetite. Soak one part of crushed coriander seeds in a glass of water overnight. Filter it next morning and add a half teaspoon of sugar in it. This drink eliminates the toxins and provides energy to the body. Shatavari is an Ayurvedic herb useful in eliminating excess pitta dosha from the body. This herb has a cooling effect and supports the proper functioning of the liver. It induces sleep and also useful in treating bleeding disorders such as rectal and nasal bleeding. This herb has an anti-cancer, anti-diabetic, anti-ulcerogenic, anti-inflammatory, anti-microbial and anti-diarrheal property. Consume 5 gram of sugar powder during night regularly. Soak small pieces of Shatavari in a glass of water and kept it for a while. Filter it and consume this daily. Consume an equal quantity of pippali and Shatavari powder in a dose of 3 to 5 gram during the night or early in the morning with the banana shake. Cucumber is the most effective natural coolant and complexion enhancer. This herb contains a high amount of water that fulfills our daily need for water. It is rich in vitamin B1, B5, B7, C and K, potassium and manganese. It is useful in various pitta diseases like burning micturition, gastritis, urinary calculi etc. Crush 6 to 10 pieces of cucumber and add 3 to 5 grams of sugar and a pinch of cardamom powder to it. Drink this one cup of juice 2 to 3 times a day. Grind cucumber in a grinder and add 20 to 30 gram of jaggery in it. Consume it in evening hours before the meal. Soak a fistful of cucumber seeds in buttermilk for overnight. Grind this next morning and add a little sugar to it. Date palm is mentioned in Ayurveda for the treatment of several diseases associated with pitta dosha. It is a good source of ascorbic and nicotinic acid. Dates are effective in enhancing the health and immunity of the body. This provides nourishment and improves the physical strength. In people with less hemoglobin and low body weight, these are very useful. The decoction prepared from the root is useful in treating mouth ulcers and gingivitis. The decoction prepared from the date leaves is helpful in treating intestinal worms, dysuria, and diarrhea. Keep your mind and body calm this will balance the pitta dosha systemically. Find different ways to engage the mind that are enjoyable and relaxing. 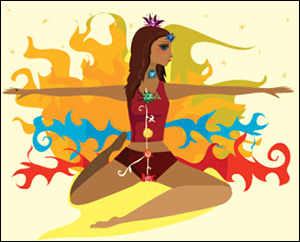 This asana rejuvenates the mind, body, and spirit and pacifies pitta dosha. 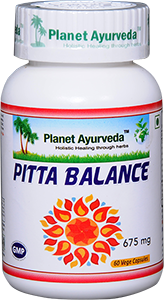 Pitta balance is a good combination which comprises of cooling compounds, natural calcium comopunds such as coral calcium (parval pishti), agate calcium (Akik pishti), pearl calcium (Mukta pishti) and ayurvedic calcium compound (jahar mohra pishti and kamdudha ras). This combination restores the pitta imbalance quickly. These compounds are best for ulcers, acidity and bleeding gums. It also contains pure extract of giloy (Giloy Satva). It restores a healthy skin and clears the complexion. It pacifies the vitiated pitta dosha and also balances the vata and kapha dosha. This product is free from fillers, additives, and preservatives. 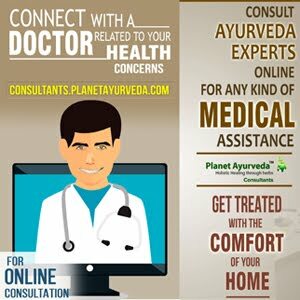 Planet Ayurveda is offering this product at a very reasonable and competitive price.